It’s end of the day and the test is failing on CI server. You can ignore it for the night and fix it as the first thing on the next day. A test should be run only on selected operating system. 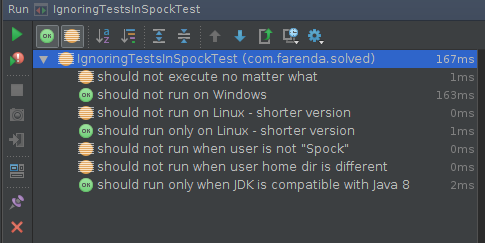 For example some tests work only on Linux, because they expect Linux specific directory to exist. On other systems the test should be ignored. A test should be run only when some environment variable is present. For example it can be a variable set only on Continuous Integration server. Ignores annotated test or whole specification. Ignores annotated test or specification, but only when given predicate is true. Runs annotated test and ignores all other tests in the same specification. Runs annotated test or specification, but only when given predicate is true. //@Ignore, @IgnoreIf, @Requires can be on whole Spec too! As you can see @IgnoreIf and @Requires are like Yin and Yang. This I like. :-) Especially the ways to exclude tests depending on available operating system.